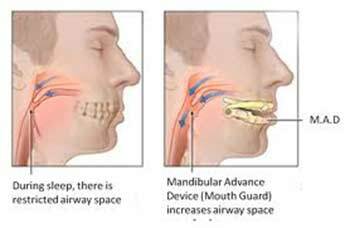 A Manibular Advancement Device (MAD mouthpiece) is an effective and comfortable device that you can wear at night in your mouth to help you stop snoring and allow you to rest peacefully the whole night long. The MAD mouthpieces are good but they are not good for many people that are TMJ sufferers. For many people that have TMJ, the MAD mouthpieces will make your TMJ pain even worse. The Mandibular Advancement Devices will help to unblock your obstructed airways by moving your lower jaw and tongue forward but if they mouthpieces are making your TMJ worse, this is not going to help you in any way. In fact, many people that have worn these MAD mouthpieces have found that their TMJ has gotten worse when they wear the mouthpieces. Some people have also said their TMJ pain is still extremely bad even after they have quit using the MAD mouthpieces. These MAD mouthpieces will hold your jaw in a forward position and many times, will either help or relieve you of your snoring because of your obstructed airways that are being blocked. The only problem with people who suffer with TMJ is that moving the jaw forward can very likely lead to shifting of tooth position and pain in the joints in your jaw will occur. If you suffer with TMJ, you know how this is not something you are going to want to mess with. TMJ disorders can sometimes even cause pain in other places besides your jaw. Some TMJ sufferers also have pain in their ear and have tooth pain along with the pain in the jaw. All of these pains can be very severe at certain times. Some people complain that their TMJ pain is so bad that do not feel like opening up their mouth for any reason (even doing basic things such as talking or eating on a daily basis). TMJ can be a debilitating disease and is one thing that you do not want to mess around with. You may see all of the very reasonable MAD mouthpieces that are going to help you quit snoring overnight but if you suffer from TMJ, you are really going to want to look into which MAD mouthpieces, if any, is going to work for you. You may just want to deal with the snoring or go to a doctor to have them diagnose you to make sure that your snoring is not a medical issue for you (such as having sleep apnea). If may even be best for you to seek the advice of your dentist to see which anti-snoring device he thinks, if any, is going to work best for you. Dentists deal with TMJ sufferers all of the time and will be able to monitor your illness and treat you best, while also helping you to be able to quit snoring. TMJ can lead to a lifetime of pain and this is definitely not something you are going to want to deal with in any way. Many people that suffer with TMJ grind their teeth at night, which will make their pain even worse. There are even some people that are using these MAD devices and the mouthpieces are making them grind their teeth even more before they started wearing these devices. If you are noticing that your mouth or jaw is hurting even more while using the MAD mouthpieces, it is most likely that you need to stop using them immediately. You do not want to wait until your jaw pain gets too severe before you decide to stop using the MAD mouthpieces. Once you get a flare up of your TMJ, it can sometimes be hard to get it to settle down. You need to try to quit grinding your teeth at night because it is going to slowly make your TMJ get worse and worse as each day passes but this is something that is easier said than done. Most people do not even realize they are grinding their teeth, especially at night time. While these over the counter boil and bite mouthpieces appear to be a cheaper and easier snoring solution, you really do get what you pay for, as the old saying goes. If something seems to be too cheap or too good for the price, it really may be true. Before you decide to try the MAD mouthpieces, you need to realize that the cost of TMJ treatment is going to be a lot if you get a flare up. You are more than likely going to be better off in not trying an economical MAD mouthpiece if you suffer from TMJ in any way. You are most likely going to have a better chance of going in to a dentist and having them prescribe you a device to go into your mouth to help with your snoring and TMJ for a better price. It is also likely, as long as you have good medical insurance, that these devices that are prescribed by your dentist will be covered in some way or form. Medical insurance is not going not cover the over the counter snoring mouthpieces in any way or form. If you suffer from TMJ, you should most likely just stay away from using MAD mouthpieces. The MAD mouthpiece's main purpose is to open up your obstructed airways but in doing this, it is going to need to move your jaw forward. If you have TMJ, you never want to have something move your jaw forward. It is very likely the MAD mouthpieces are going to make your TMJ pain worse. There are many other things that you should try to help get your snoring under control at night. Some of the things that you may want to look into before seeking the advice from your doctor or dentist may include: anti-snoring balls, anti-snoring pillows, or anti-snoring nasal strips. You doctor or dentist may even suggest that you go to a sleep specialist to have your snoring evaluated even further. Agreed on melatonin, Nancy. It can make for a strange sleep, and certainly can make waking up difficult. Malocclusion is the root cause of uneven condylar. Then our body tries to have even condylar by grinding or clenching teeth which we know as Bruxism. Prolonged bruxism leads to TMJ disorder and TMD. There are strong associations between Bruxism and Sleep Apnea which including Snoring. The correction of occlusion or the treatment of malocclusion is the upstream approach and effective treatment for Bruxism, TMD, Sleep Apnea, Snore and Atlantoaxial subluxation. Thank you Dr. Leowsrisook for your input. Wish more dentists would stop by with that kind of expertise! Cheers! Appreciate the comment, Dr. Leowsrisook. I wish more dentists would stop by to provide their expertise!